If the traditional western is a tale in which cowboys establish a society and a rule of law that they do not fit into (the reason they have to ride off into the sunset), then Slow West is the preface to that tale, the movie that makes the need for society and for rule of law unbearably palpable. Its most intense moments revolve around this need for a governing force on two different levels: the individual and the community. 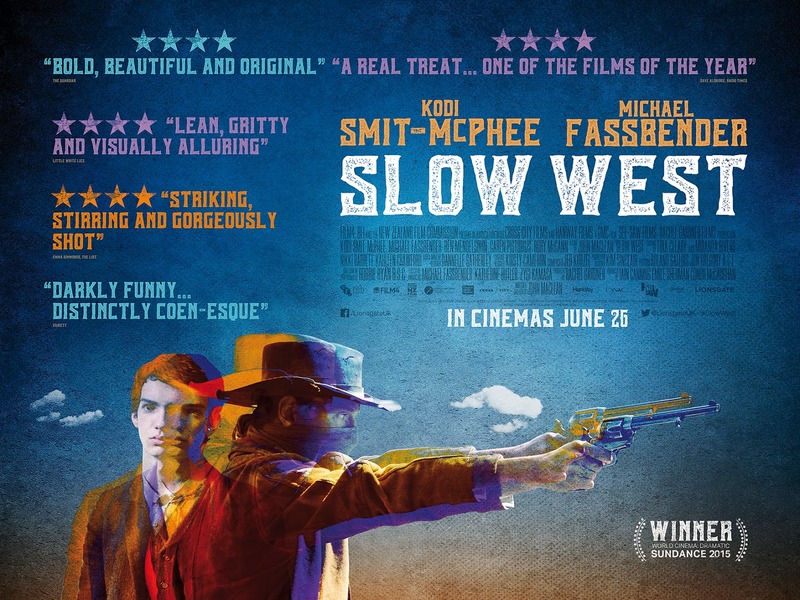 Jay Cavendish (Kodi Smit-McPhee) came to America to find the woman he loves (Rose Ross, played by Caren Pistorius), but instead he finds Silas Selleck (Michael Fassbender), a gruff bounty hunter who reluctantly takes him in when he sees how unsuited Jay is to the Western frontier. But Silas has more on his mind than helping this lost boy: Rose has a bounty on her head, and he hopes Jay will lead him right to her. In terms of the individual, the film almost becomes a character study each time it settles down to focus on Jay. Silas is both the foil to Jay (he's seasoned and pessimistic to Jay's naive optimism) and a twisted sort of father figure (Jay's father was killed back in Scotland, so Silas has to teach him to shave). But Silas is far from an ideal father figure: he's initially using Jay to lead him to Rose, and through his internal conflict the film shows the impact of fatherlessness on the world (like Rio Bravo). 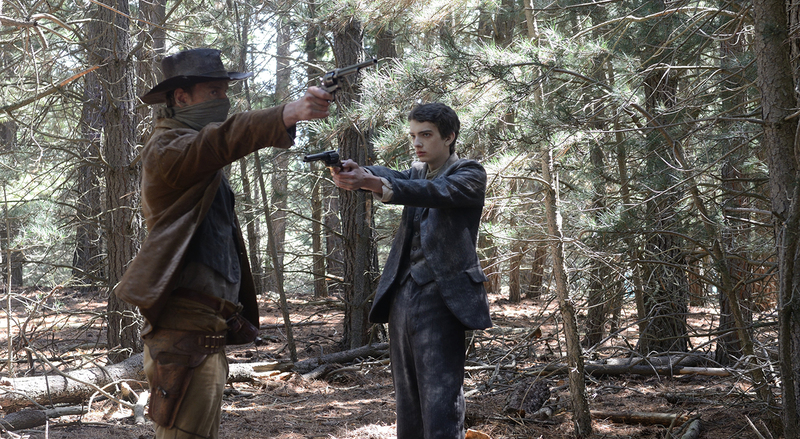 Slow West is a hymn to the los fathers both of ourselves and our society; a call for a return to domesticity. 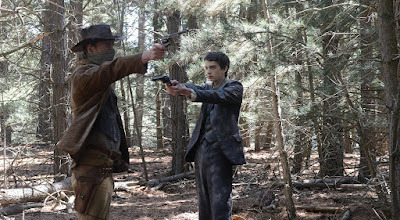 In terms of the community, the film almost becomes an action/thriller each time there's a stick-up in a general store or a shootout around a remote house, creating a thick tension based on the complete lawlessness and chaos that ruled (or didn't, in this case). The West forced everyone to learn to defend themselves from an early age, with often heartless results that the film doesn't shy away from (two young children see their parents killed, and the characters are essentially powerless to help). The only recognition that seems possible in this world is to have a wanted poster put a dollar value on your life (a familiar theme for the western), foreclosing any positive avenues for personal redemption. You can’t even buy groceries without fearing for your life, and there's nowhere to turn for help. There are no heroes in this world, only "rising devils and falling angels." This "demythologizing" of The Wild West is far from a new concept (John Wayne even dethroned himself in The Searchers), but it's executed well enough here to stand on its own. The digital cinematography is just astonishing. 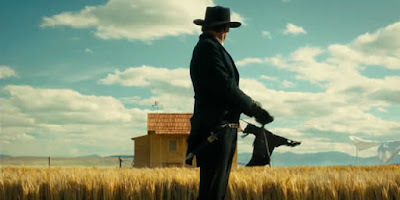 The colors are saturated enough to stand out from traditional gritty westerns (blues in particular), yet with enough texture to keep them from becoming cartoonish. Everything is shot in deep focus, and quite a few of the compositions are simply breathtaking, presenting open landscapes that mirror the open nature of the world at large (emptiness both of film frame and of governing power). I also counted several split diopter shots, which is an in-camera technique that just makes my eye balls happy. With enough emotion to be a straight drama and enough tension to be a straight thriller, the film instead plays out primarily as a mood piece. This mood shifts from serious and tragic (particularly when it attempts to tackle loss of innocence) to comedic and farcical (the gag with the salt and Fassbender’s hilarious introduction) without ever completely unifying into a cohesive whole. This seems to be where the comparisons to the Coens' True Grit remake come in (dark comedy about the harsh realities of the West), but to me Slow West feels less like dark comedy and more like a slow-burn with its emphasis on atmosphere. Overall it’s a very well told tale (scenes like when they clear out the skeleton from the tight passage while talking about Jay’s relationship smartly dress up exposition with world-building and background flavor), and what it accomplishes in its short run time is undeniably impressive. It strikes me as enigmatic enough that it might benefit from a revisit (maybe the different tones would tie together a little more), and it’s such a strong directorial debut for John Maclean with such a distinct (if potentially undeveloped) voice that I’ll certainly have my eyes open for whatever he wants to do next. 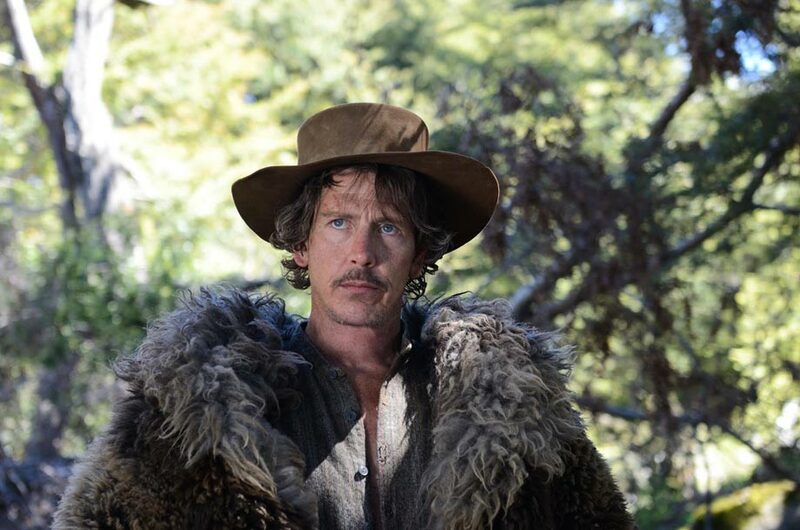 My one tangential regret about Slow West that has no real relevance to the film’s quality is that Ben Mendelsohn didn't have a bigger part. This seems like the kind of movie where he would have read for the leading role and been given the smaller one because Fassbender is a bigger name, and I would love to see him given something a bit meatier.